One of our more popular saints. A google search turns up a half million hits on her name. It’s really quite remarkable considering she only lived to be 24 years old. She lived from 1873 to 1897, recently enough that there are photographs of her and she was quite beautiful. She was canonized in 1925, just 28 years after her death. In 1997, Pope John Paul II declared her a doctor of the church. She was the youngest person ever to be declared a doctor and only the third woman. Her memoirs, The Story of a Soul, were published after her death and became a world-wide best seller and devotions to her spread all over the world. Therese was a sickly child. In fact, they didn’t expect her to survive, partly because her mother wasn’t able to nurse her. Her parents sent her away for fifteen months to live with a friend who nursed her and took care of her. When she returned home her parents found that she was very intelligent and very stuborn. She learned to read by the time she was three. Her mother died when she was just four. At about the age of eight, Therese began to suffer from illness, an illness that the doctors couldn’t cure. But, after staring at a statue of the Blessed Mother, whe was cured. At fifteen, she wanted to follow her two older sisters into the convent, but was told she was too young. In 1887, her father took her and her sister to Rome. At an audience with with Pope Leo XIII. She begged him to approve her entry into the Carmelite convent. The Pope told her to do as the superiors said. She refused to leave until her request was granted and she had to be removed by the Swiss Guards. Remember, I said she was stuborn. Shortly after that, the local Bishop instructed the prioress to admit Therese. Therese was remarkable in that she suffered ill health most of her life and that in just twenty-four short years, she was recognised as the saint that she was. She was a hard worker in the convent in spite of her illness. Her life in the convent made it difficult for her to perform great things. A lot has been said and written about the Little Flower. As I said, there are hundreds of thousands of places on the Internet where you can read about her. I think her greatest lesson for us is that it’s possible to live a saintly life just by doing little things, and that it doesn’t really matter how long you live. 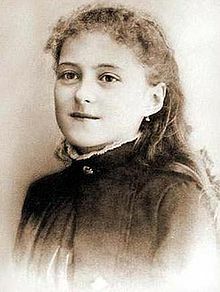 Saint Therese of Liseux, pray for us.